The good thing with pydPiper is that it gives you complete control over the information to display and how to display it (font type and size, position on the screen, scroll direction and speed), and it can even display an image (yes, even on a 16x2 oled!). Create your moode installation and add the ssh file. Be patient. It takes several minutes. Make sure there is a message at the end saying the docker is installed. Otherwise it will not work. 3. Configuration. You will have to answer a few questions depending on the display you use. For the 16x2 oled display with parallel interface. Note that this is not actually a code. You answer manually line per line (copy and paste). I presented it as a code so it is easy to distinguish from the other text. "control-c" to end the test, "exit" to go back to the command prompt. You will have numbers only like 27 or numbers with letters like 3c, your i2c adress is 0x27 and 0x3c. In the sequence section, replace every "stream" by "encoding", so that you have db['encoding'] instead of db['stream']. ctrl-x, yes, enter when finished. i2c interface is known to be slow. To improve the performance for a good refresh rate, you have to edit the configuration. Thanks for such a detailed write up Remy ! 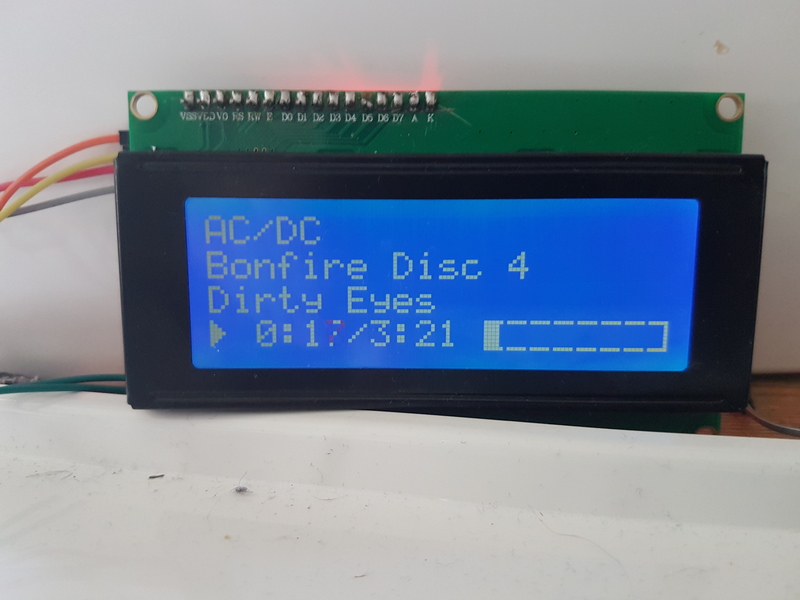 I plan to try the 20x4 lcd version this weekend on a MoOde Radio player for our kitchen. Must be something vital missing here...is it a complete a to z or are there other settings we need to configure within MoOde...lcd update engine, metadata, path to .py script ??? What needs configuring for the page file for the 20x4 lcd with i2c interface ? is there a sample we can use to get first output then modify to suit..? A big thanks to Remy1961 for his excellent tutorial. It’s great to see a well written and complete tutorial. Still no output to display... no welcome message. Any debugging I can run ? (09-10-2018, 08:52 PM)DRONE7 Wrote: Reinstalled and reconfigured. I checked /var/log/pydPiper.log but that is an empty file.. I guess the i2c adress 0x27 did not work, and that 0x3f was from sudo i2cdetect -y 1. Other than that everything in the configuration seems good for a 20x4 LCD with i2c interface. I assume the connections are correct (sda connected to physical pin 3 and scl connected to physical pin 5). What about the docker, I assume it was installed correctly, with towards the end of the installation several packages being downloaded and extracted. If nothing works, let me know, I will try to do again an installation from scratch since I happen to have the same display. I went off for refreshments and when I returned it was starting !. Will finish the install and test a while but I might be returning to BryceJ's script which has a lesser overhead for this Pi. Docker and Python at 65% cpu vs BryceJ's script at 0.9%!!! I had a 20x4 display in addition to the 16x2. I have been testing on a Pi2B with Moode 3.8.4. Changed displays and repeated Step 3: sudo python configure.py and edited the "pages_lcd_20x4.py" file. No problems and works on address 0x27. I am also powering the display and backpack with 5 Volts only to the backpack without problems. pydPiper starts less than a minute after moOde boots.